The 2019 Americanism and Government Trip has just returned from Washington D.C. and was a huge success. 18 of the top winners of the A&G test were selected for this trip to Gettysburg and Washington DC. The students this year were as follows…. The American Legion trip is not like the typical 8th-grade trip most Ohio teens experience. We have a smaller group of students and focus on history, Americanism, and respect for the men and women who have given their lives for our freedom. Tuesday was one of the biggest highlights of the trip. The American Legion has placed a wreath at The Tomb of the Unknown Soldier every year since 1936. This year was no different. The young leaders visited many sites in Arlington National Cemetery, including the new headstone of former Marine Corp aviator, engineer, astronaut, and Ohio Senator John Glenn. Viewing the changing of the guard as well as placing the wreath at the tomb is always a very emotional highlight for The American Legion and the students. This year, Junior Macray Kester and Senior McKenzie Miller were selected as the student wreath layers. They were accompanied by Department 1st Vice Commander Roger Friend and Auxiliary 1st Vice President Kristen Little. It is a once in a lifetime experience which will be remembered by these two outstanding students. The highlight of Wednesday was a visit to the Capital Building as well as meeting our Ohio Congressmen Jim Jordan. He was kind enough to meet our group on the steps of The Capital and speak to our students. We also were thankful that Senator Browns office allowed us to tour the underground tunnel system between the senators office and the Capitol. We also visited the Supreme Court and National Museum of American History along with other numerous monuments. Thursday was a visit that is always a favorite…… Quantico. Quantico is an active Marine Corps base and FBI Training Academy that is the headquarters of the Presidential Helicopter Squadron also known as HMX-1 or Marine One. We were briefed by a Captain that is on the Presidential detail, and he gave us a tour of the base. The trip ended with a stop in the hanger, where the students walked inside and sit in the piolets set of a Bell Boeing V-22 Osprey. It is a tilt-rotor military aircraft with both vertical takeoff and landing. They also received a briefing and sneak peak of Officer Candidate School. Before leaving Quantico, they had the “chow hall” experience for lunch. During the trip we also visited many monuments and memorials which included the Air Force Memorial, American Veterans Disabled for Life Memorial, Korean War Memorial, Pentagon Memorial, World War 2 Memorial, the Vietnam Wall, FDR Memorial, Jefferson Memorial, Lincoln Memorial, MLK Jr memorial, Marine Corps Museum, Law Enforcement Memorial and Museum and Navy Memorial. Our final stop on the way home was the new National Veterans Memorial and Museum in Columbus, Ohio. We all returned home on Friday. The 18 students that accompanied us chaperones on the trip were indeed a joy and a pleasure to spend the week with. Saying that this trip and this group of young leaders are fantastic is an understatement. Words cannot describe the knowledge, passion, and drive each one of them has. We are so very thankful that these 18 individuals are the future leaders of America. We will keep you updated on them; they are going to be doing big things. The Americanism and Government Test program of the Ohio American Legion was created by Legionnaires of Ohio in 1936 and remains today as another of the leading youth programs of the Ohio American Legion. Although created by the Ohio American Legion, the Americanism and Government Test program is a joint venture and partnership with the Ohio American Legion Auxiliary, which is a cosponsor of the program. The Americanism and Government Test program is open to students in grades 10, 11, and 12. Students in grade 9 may take the test for practice only. The Americanism and Government Test is a fifty (50) question test comprised of True/False, multiple choice, and fill-in the blank. A three hundred (300) word essay is also part of the Americanism and Government Test and every student taking the test writes on the same essay topic. The essay is utilized in the various judging levels of this program as a Tie-breaker. The essay topic is selected/written each year by members of the Department Americanism Committee and Department Americanism Director. A feature of the Americanism and Government Test is that the students themselves do not advance in the competition, the student’s test paper does. The 50 questions of the Americanism and Government Test are written in such a manner to be current and topical to events, studies, and information being presented in Ohio high schools and events happening in the state of Ohio and the nation. On average, over 65,000 students participate in the Test program annually. Through a number of judging levels in the state of Ohio to select Post, County, and District winners, the initial field of 65,000 students is narrowed to 84 district winners, whose winning test papers are submitted to a State Judging Committee for this program. The State Award from the Ohio American Legion for the 18 State winners is a five (5) day, all expenses paid trip to Gettysburg, Pennsylvania and Washington D.C. under the direction of the Department Americanism Director, accompanied by representatives of the Ohio American Legion and Ohio American Legion Auxiliary. A highlight of the trip is a Wreath Laying at the Tomb of the Unknowns at Arlington National Cemetery. The Ohio American Legion and Ohio American Legion Auxiliary have had the honor of laying a wreath at the Tomb of the Unknowns every year since 1936. An objective of the Ohio American Legion through the Americanism and Government test program is that if by taking the test a young person is inspired to learn more about government, the United States, and to appreciate the freedoms enjoyed by the nation’s citizens, the effort put forth by the Ohio American Legion and the Ohio American Legion Auxiliary is worth the expense. The Americanism and Government Test program is unique to the national America Legion organization as only two other states, Indiana and Wisconsin, have versions of the program, which both adopted/adapted from the Ohio American Legion, but neither program is the size or scope of the Ohio program. The American Legion Buckeye Boys State program is an eight (8) day “hands-on” experience in the operation of the city, county, and state levels of Ohio government, the organization of Ohio political parties, and the relationship of one to the other for young men coming out of their Junior year of high school. Through the Buckeye Boys State objectives of “learning by doing” young men attending the Buckeye Boys State program will learn more about city, county, and state government in eight days than they would in an entire semester of high school. Conducted annually in mid-June, the American Legion Buckeye Boys State program is conducted on the campus of Bowling Green State University in Bowling Green, Ohio and is open to young men who have completed their junior year of high school prior to the start of Boys State and will be Seniors in the fall. The American Legion Buckeye Boys State program is the largest Boys State program in the nation with an annual attendence of over 1,200 of the top high school juniors in the state of Ohio representing 600+ high schools in the state and the home schooled community. The American Legion Buckeye Boys State program is regarded within the national American Legion organization, and in education circles, as the #1 Boys State program in the entire nation. The Sons of The American Legion, the Ohio State Highway Patrol, the Ohio State Bar Association, and the agencies/departments of Ohio government are partners in the American Legion Buckeye Boys State program. 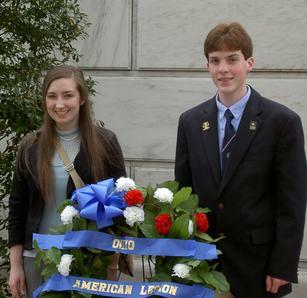 High school students in Ohio, including home schooled, are afforded the opportunity to gain financial awards to assist the students in their pursuit of higher education through participation in The American Legion High School Oratorical Scholarship program, a public speaking contest on the United States Constitution which focuses on the duties and obligations of a citizen to our government. On the Saturday prior to memorial Day, the Department of Ohio conducts this program which involves Dayton and the surrounding area Venture Scouts, Boy Scouts, Cub Scouts, Girl Scouts, Brownie Units, The American Legion Auxiliary, Sons of The American Legion, and Legionnaires. Scout representatives place American Legion flags at the headstones of over 40,000 graves. The American Legion sponsors the “Avenue of Flags”: 425 flag poles bearing the casket flags of deceased veterans, which are flown on Memorial Day and Veteran’s Day. On the Saturday prior to memorial Day, the Department of Ohio conducts this program which involves Rittman, Medina, and the surrounding area Venture Scouts, Boy Scouts, Cub Scouts, Girl Scouts, Brownie Units, The American Legion Auxiliary, Sons of The American Legion, and Legionnaires. The Department of Ohio provide support in donations to the Special Olympics State Winter Games and State Summer Games, and also hosts a breakfast for over 400 Special Olympics athletes and coaches at the Special Olympics State Winter Games. At the Summer Games, the Department of Ohio provides the funding for “Tent Town” booths, a very popular attraction operated by the Franklin County Legionnaires with assistance from several other districts, American Legion Auxiliary, and the Sons of The American Legion. The American Legion Department of Ohio’s operation of “Tent Town” is the largest among all corporate and organization sponsors. There are 135 American Legion Chartered Scouting Units in the Department of Ohio with over 2,600 participants. The Department presents the “Department Eagle Scout of the Year” award annually. The Department winner advances into the National American Legion competition and receives a $500.00 financial award from the estate of Mikeal and Frances Golato. The Department of Ohio recognizes outstanding Ohio educators at the State Convention annually for contributions made to the field of education, Ohio students, and the Department of Ohio American Legion. The “Educator of the Year” is selected from 14 district educator nominees. 46 Senior teams and 13 Junior teams entered into the Department season for a total of nearly 1,100 young men playing American Legion Baseball. The Department of Ohio has had seven (7) American Legion Baseball World Series champions. The last National Champion from Ohio was: George W. Budde Post 507,Cincinnati, Ohio-1988. The Department Americanism Office serves as the administrative liaison to The American Legion National Headquarters Citizens Flag Alliance whose efforts are to secure a proposed constitutional amendment to protect the United States Flag from physical desecration. The Americanism Office provides support services to Department Citizens Alliance Chairman with mailings, xerox services, and other administrative services. Since 1919, The American Legion as a national organization and the Ohio Department of The American Legion have been strong proponents for educating the general public, especially the students in the nation’s schools, on the proper care, display, protection, and disposal of the United States Flag. The American Legion Department of Ohio and the Posts of Ohio provide schools, institutions, civic, and youth groups with information and flags for ceremonial, educational, and display purposes. The Posts of Ohio conduct many presentations throughout the state on the proper folding, care, and display of the United States Flag. The Posts of Ohio also conduct proper flag retirement ceremonies for United States flags that are no longer flyable and conduct graveside flag ceremonies for the funerals of deceased veterans. A number of assets regarding United States flag education and United States flag etiquette are available upon request by contacting the Americanism Director. A joint program of the Department of Ohio American Legion, Ohio State Highway Patrol, Ohio State Highway Patrol Auxiliary, and The American Legion Auxiliary conducted at the Ohio State Highway Patrol Training Academy in Columbus, Ohio. 20 young men are selected at Buckeye Boys State, 20 young women at Buckeye Girls State, and 10 sons and daughters of Highway Patrol officers attend a mini-course in Law-Enforcement, taught by Patrol officers, which culminates in a Graduation Ceremony attended by Patrol, Legion, and Auxiliary officials. The Department of Ohio Americanism Office promotes the Department “Red, White, and Blue Award” program to recognize people and organizations in local communities for flying the flag and positive contributions to their community. The Department of Ohio Americanism Office promotes the Schools Awards program to recognize the achievements of elementary, middle, junior high, and high school students.